"Never give the mind more than you give to the hand." 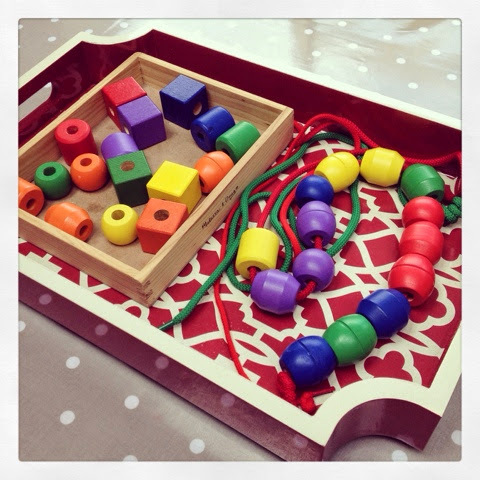 From 7 months old Culturebaby started to to show a great interest and dexterity with shape sorters, and this began with the simple action of putting a ball through a hole in a box again and again. 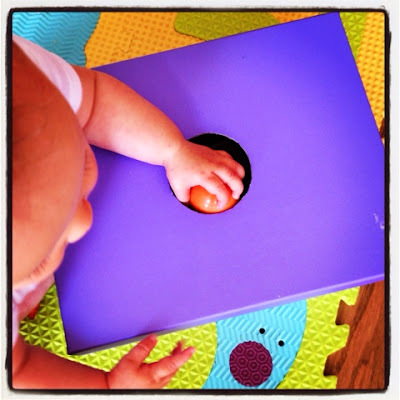 This is an ideal introduction to the fabulous world of puzzles and serves to train the grip of the hand, the brain in observing the effect of depositing a ball and seeing it emerge elsewhere, and helps the infant to connect the two - using intention to place the object in a specific place to cause a simple process. 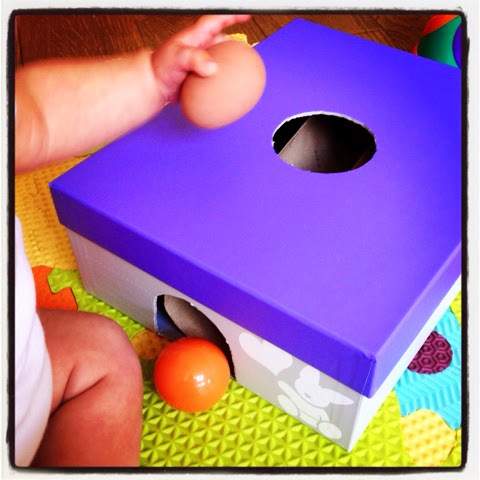 Find a small sturdy shoe or gift box and cut a hole in the lid large enough to fit a small ball through. Cut out an archway at one end. 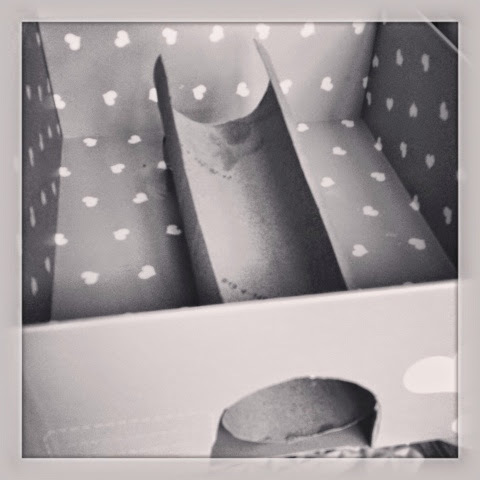 Then slice a paper towel roll along its length and open up to create a shute. 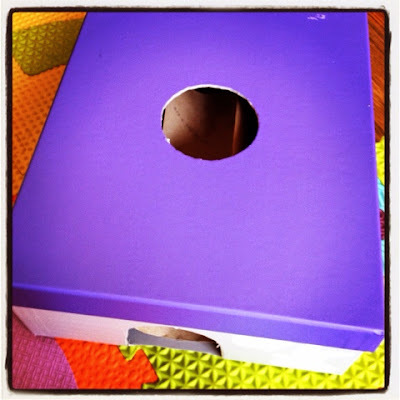 Fix one end around an inch high using a card platform, and the other to the base of the box. Attach lid. She also needs to work on strengthening her pincer grip (very important for writing, cutting etc...) so we rigged up a simple clothes line using a long ribbon and provided a basket of wooden clothes pegs. We could see her develop her confidence and dexterity with this as she went along. 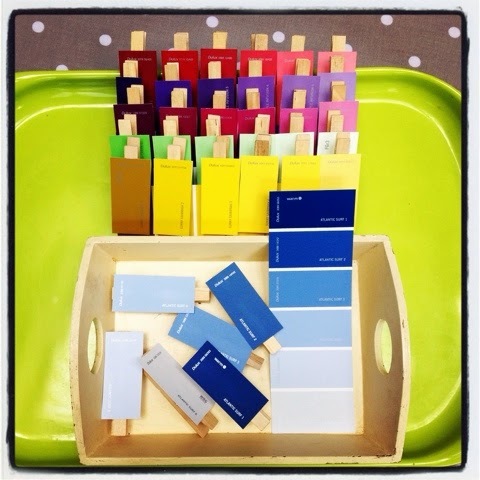 Soon she was ready for a home made activity I created to develop both her skills in differentiating between shades of colours and her pincer grip. I saw this clever idea out there in the blogosphere and have been meaning to do it for a while. It is simple to create and great practice for her in both these areas. 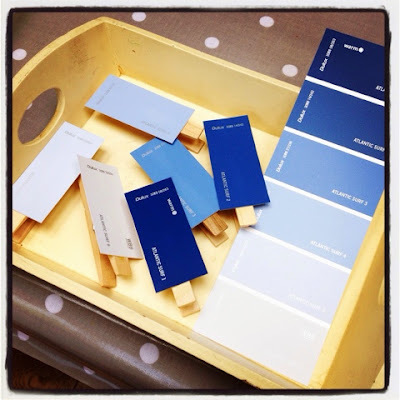 Collect two matching paint swatches showing gradations of colour from dark to light from a hardware store. Keep one whole and cut the other into strips. Attach each strip to a wooden clothes peg with contact adhesive. With each new activity of this sort, start by demonstrating and discussing the aim. 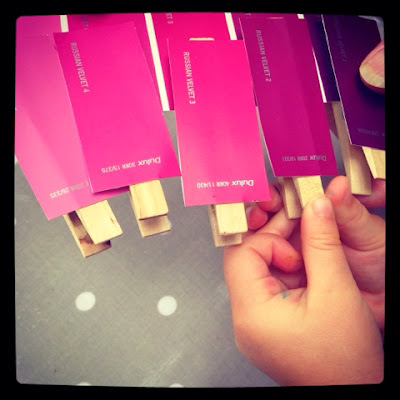 Here we need to match the correct shades in pairs by fixing the clothes peg to the card. 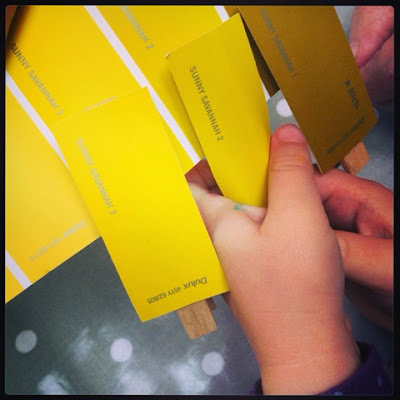 Offer one colour at a time and give the child a choice of which. As the fixing element of this task is tricky and Culturebaby is still using two hands to squeeze the peg, she needs help holding the card. Happily she managed to match the shades well and we will continue to work on greater strength and independence with this one. 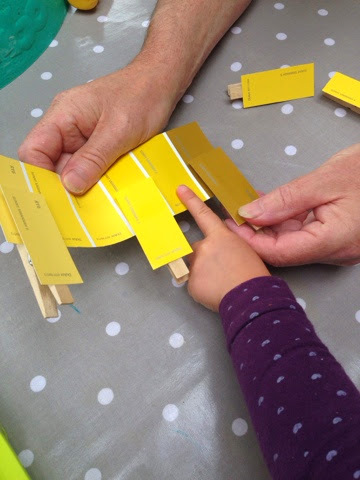 When Grandad arrived she immediately introduced him to this new activity, so she must have enjoyed it. This cost around £1 to create and makes a great portable busy bag.